Insert the Endless USB stick or DVD into a USB slot or DVD drive on your computer and restart your computer. Most newer computers can boot from a USB flash drive or DVD. If your computer does not do this automatically, you might need to temporarily choose a different startup device or edit the BIOS or firmware settings. If your computer supports booting from USB or DVD, you can often choose the device to start up your computer from a menu just after the computer turns on. 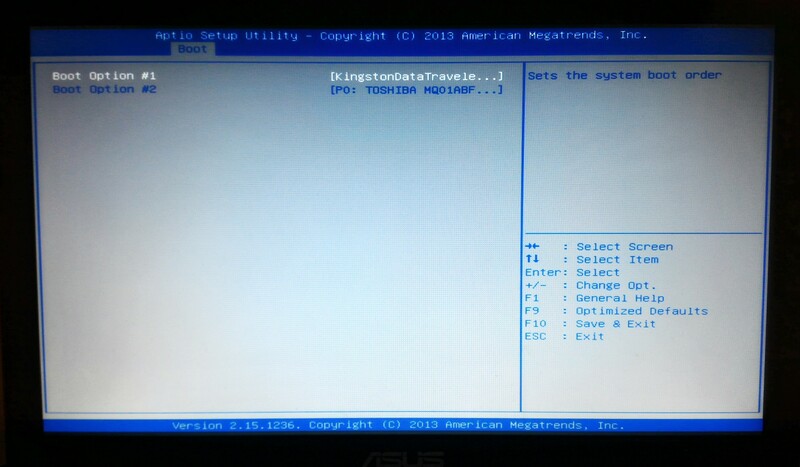 Typically the first screen will display a message telling you which key to press to enter the boot menu or choose a different startup device. This key might be something like F10 or F12. If you can’t see which key to press, you can search for your computer on boot-keys.org. Press this key to enter the boot menu when your computer is booting. Select the entry matching your USB disk or DVD drive and press Enter to start up Endless. The menu on your computer may show the brand name of your USB disk, “removable drive”, “USB media”, “USB hard disk” or “USB-HDD”. If your computer doesn’t have a menu to choose the startup device, you will need to change the order of startup devices in the BIOS or firmware settings. To do this, when your computer starts up, watch for a message telling you which key to press to enter setup. It will usually be something like F1, F2, F9, F10, DEL or ESC. If you can’t see which key to press, you can search for your computer on boot-keys.org. Press this key while your computer is booting to edit your BIOS settings. Use the arrow keys to find the setting marked “Start up” or “Boot order” and find the entry for “removable drive”, “USB media” or "DVD drive". 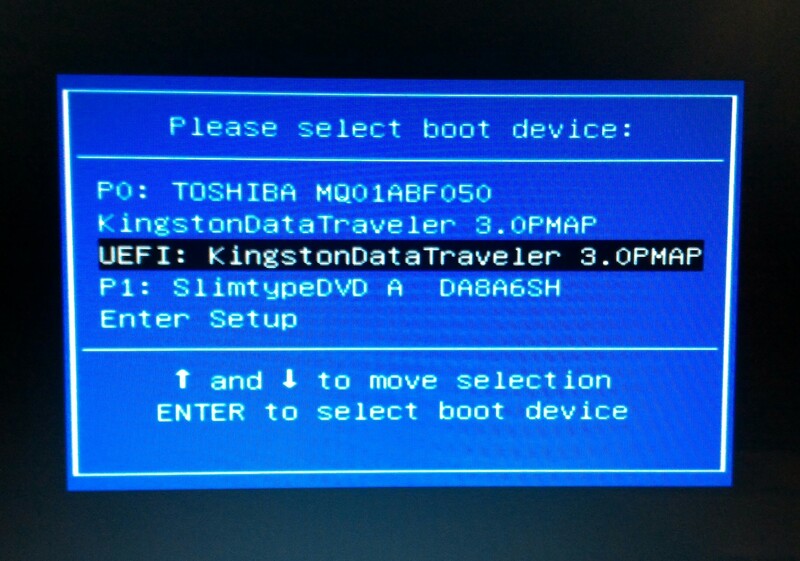 Move this to the top of the list to make the computer attempt to boot from the USB device or DVD drive before booting from the hard disk. Usually, you have to press a certain key such as F10 to save the changes you’ve made to the settings. You should be able to start up your Endless OS USB disk or DVD using one of these methods. If you still have trouble please contact us on our Endless Community. Here are two examples of how to boot your computer through the USB Stick with Endless OS. The same process can be done with the DVD. Note that BIOS settings screens are different on every computer, so you will not see exactly the same options on your computer as in these screenshots. We use a Kingston-brand USB stick in these examples; if you're using a different brand, look for that brand in the menus. 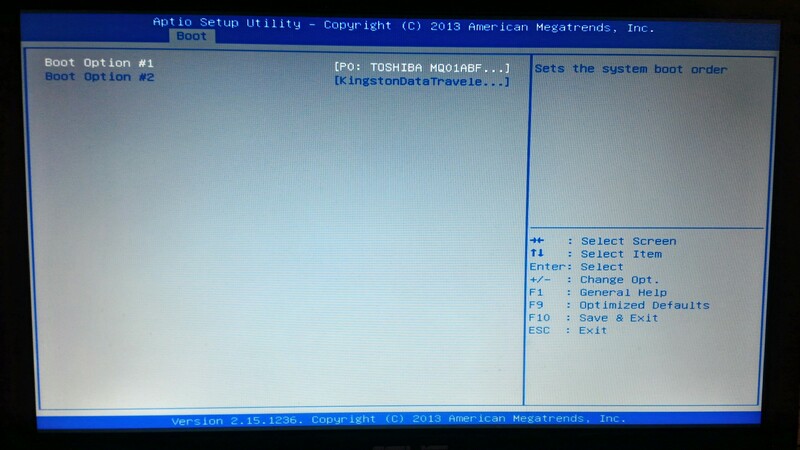 1- Connect the USB Stick with Endless OS, turn on the computer and pressing the ESC key to access the BIOS boot menu or firmware boot menu. 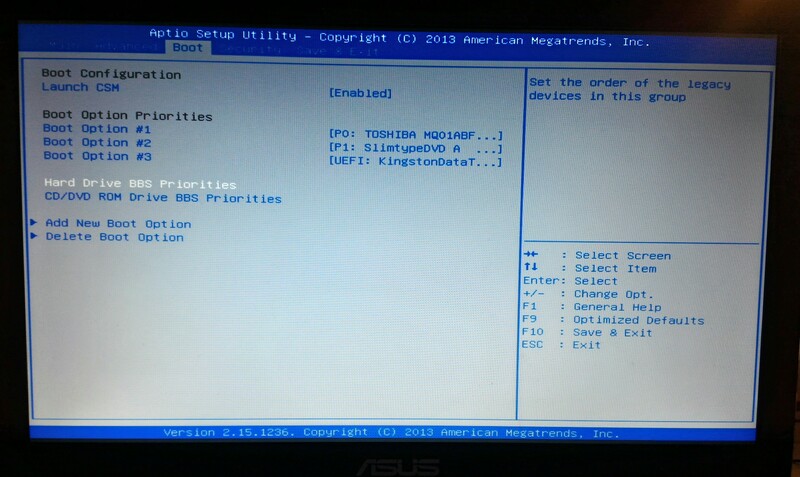 2- Configuring the BIOS boot order. 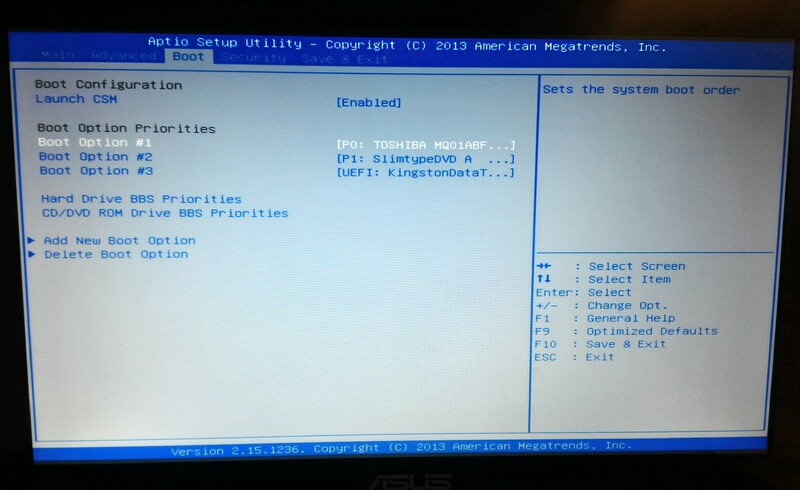 - When accessing the BIOS settings, look for the Boot option. - Go to the Hard Drive BBS Priorities option and press Enter on top of this option. Look for an option named something like 'boot priority'. Select this option with the arrow keys, and press Enter. In this example, the option is called "Hard Drive BBS Priorities", but the name may be different on your computer. - You are most likely to find Boot Option # 1 and Boot Option # 2. Press Enter in Boot Option # 1. - A menu will appear for you to choose between the hard drive of your computer and the USB device with Endless OS. Select with the arrow keys the USB device and press Enter. 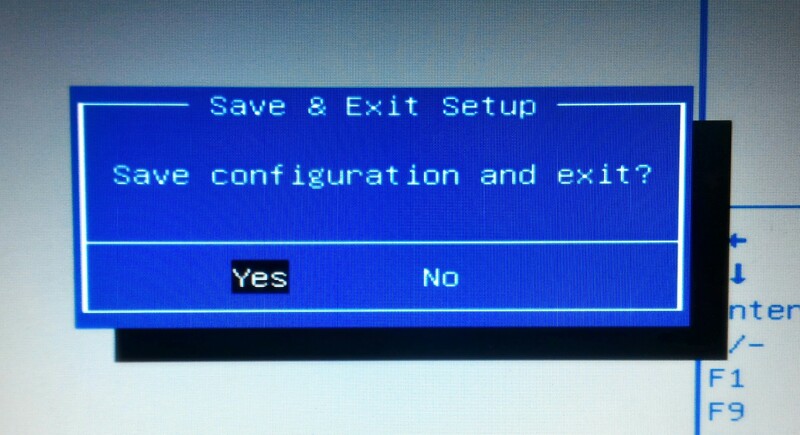 - After selecting the USB Stick, it must be configured as the first option in Boot Option # 1. - Save your changes, possibly by pressing the F10 key, and press Enter. - The computer will reboot from the USB stick.